20 years ago after an epic dive trip leading to one of Bill Cleary's many deep water certifications, Bill's instructor Bob Wilson suggested they celebrate at Red's. Bill fell in love with the bucolic new England style of the place and of course the fresh seafood. In 2014 after years of negotiating and other successful restaurant ventures, Bill and his partner Marisa Tanner bought Red's. With Bill's attention to detail and Marisa's outstanding management and customer service skills, Red's has grown in popularity! Positive changes are always being made without impacting the traditions that long time Red's customers love. Among these traditions is Red's commitment to serving only the freshest seafood. Our waterfront location just steps from the Atlantic Ocean allows for locally caught lobsters to be delivered right to our docks by local Lobstermen that supply Red's exclusively. The result is consistently excellent quality that fulfills our customers high expectations. The same holds true for other locally caught favorites that customers watch being unloaded at the dock daily. As for our other excellent seafood selections that come from other regions Red’s buys from only the top tier of purveyors who can meet our rigid quality control standards. My wife and I visited twice in one week after living in the area for years. The food was tremendous- the lobster mac and cheese, and seafood pasta dishes were decadent and the quaint building had us feeling like we were in a New England fishing village! Reds is a true hidden treasure in Point Beach! "Great introduction to East Coast Seafood"
As a Brit visiting the east coast, this was my first taste of lobster rolls before travelling up through New England. It wasn't the cheapest meal but the menu is solid, and staff on hand were helpful answering our queries. The lobster cheese melt was insanely delicious. We had a great time! "Great Food & a Friendly Staff"
Got a delicious takeout meal from Red's during a late season trip to Point Pleasant. Very good and extremely fresh seafood! Next time we'll eat there because it had a nice water view. Great view of water and fishing boats.Lobsters steamed all sizes best anywhere.Asian oysters,clams on half shell lobster rolls fresh and fabulous. BYOB. Dining inside or out on the deck, the experience is outstanding. My wife and I have been going here all summer, and it is what we wait for every weekend. Everything is right off the boat fresh, and often has a creative flourish to it. The help is pleasant and eager. You just cannot go wrong at Red's. "Still the Best Fish & Seafood at the Jersey Shore"
Red's continues to excel under its new ownership, preserving the tradition of whiteboard specials (see photo), red checkered tablecloths, attentive service and generous portions of superb fish and seafood. We dined here last week and enjoyed two excellent dishes. I ordered Pan-Seared Swordfish topped with lump crab meat, shiitake mushrooms, sun dried tomatoes and artichoke hearts with a lemon chive beurre blanc over grilled polenta and broccoli rabe. It's one of the best entrees I've ever tasted - kudos to chef Eliel! My wife ordered the Baked Wild Mushroom and Shelled Lobster Strudel in a lobster basil cream sauce with chive mashed potatoes and baby vegetables. This started out as an appetizer years ago, and was so popular that it was added to the whiteboard menu. Neither of us was able to finish our portions, and enjoyed the leftovers the next day. Its location on the Manasquan River and BYO status add to its appeal. This was such an awesome place to dine. Looking forward to returning. Best Lobster Mac N Cheese! Also enjoyed the outside dining right on the water. Pricing very reasonable. Can't wait to go back. I am a regular at Red's and I swear it gets more delicious every time I go! The location is great, the food is amazing and the staff is always pleasant!! I would recommend Red's to anyone. The Lobster Bisque is the best I have had, it's a must to get this with your meal!! It's hard today to find a restaurant that can serve quality lobster dinner without the outrageous price. Reds Lobster Pot did that - fast service, casual outdoor environment, byob (and we did), great view and excellent food. This is the restaurant for people who don't mind eating with their hands (wet-naps provided). We shelled our own shrimp, cracked our own lobsters and frankly it was some of the best, freshest seafood I've had in a long time. We wanted a fun, casual place for a business dinner and found it at Reds. I'll be back in September. "New Owners, but still Red's"
When a restaurant with a long-standing tradition changes owners, it often loses the ambience that made it so special to so many customers. Not so with Red's. This seasonal BYO on the Manasquan Inlet continues to shine under new owners who wisely decided not to trifle with tradition. We had dinner here shortly after it opened in April and remain big fans. Still the whiteboard specials, the red checkered tablecloths and the best fish and seafood at the Jersey Shore. I had lobster bisque, crab cakes and brought home a slice of key lime pie for the next night's dessert. My wife had the lobster strudel, another long-time Red's special. All were superb. Service continues to be attentive and flexible, accommodating to dietary quirks. We'll continue to be among Red's biggest fans! 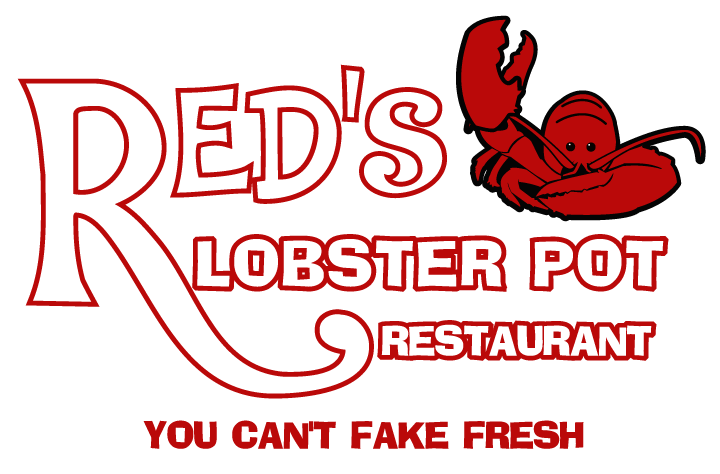 "If you visit Point Beach, don't miss Red's"
Although they will be closing soon for the season, if they haven't already, make sure next time you are in Point Beach next summer you visit Red's Lobster Pot. It is a no frills, rustic ambiance with the freshest, best lobster you are going to find at the Jersey Shore. Great waterfront spot is perfect for lunch or dinner. Don't miss it! Gloria J. Wines, CA Sell Their Wine Here by the Bottle! Select items from the DOckside menu are available for indoor dining. Red's apparel also for sale!